Remember those early morning school wake-up calls your mum had to make by shouting out your name from the kitchen or better yet, pulling the blankets off you if you ignored her and continued to snooze. or then there was the technological and digital substitute to the ever-so empowered ‘Mother alarm’, the actual alarm clock. The Android space brings to you the same features wrapped in the form of an alarm clock only taking the task of waking up in the morning to the next level. While the outside world may see this as spoiling you, this nifty alarm clock in play known as Timely Alarm Clock actually makes sure you wake up to the best alarm ever, and never fail to do so at any time other than the right time! The clock is designed to match all your needs be it cool graphics to see the colourful morning through your mobile screens or sounds that will cheerfully wake you up to a serene morning. Once you enter the Timely Alarm Clock app, the first thing you see is the scrollable set of numbers to your left that you can drag straight to the center of your device screen and the alarm will automatically be set for you. 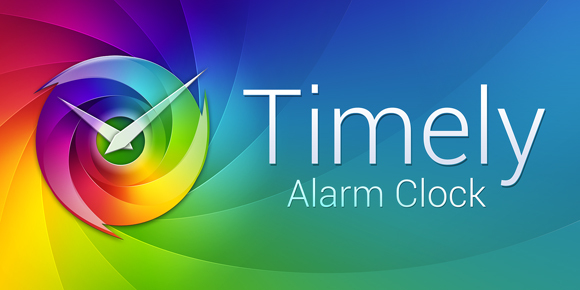 You can even name alarms and set multiple alarms that will appear as a list on your screen. These could be set for the weekday or weekend or custom alarm names like ‘Time for work’, ‘even the suns about to set back’, ‘it’s about time’ etc. The next thing on the list is waking up to your favorite sounds and the fun variety of custom sounds available within the Timely Alarm Clock app are more than enough for you to make your waking up experience a lot more enthusiastic. These sounds are visible on the screen below the time display so you know what song will play at what category of alarm. You can also simply click on any of the set alarms and change the layout in terms of the colours available. You could choose from a pre-set of colours and even change the colours through spectrum available to you, once you click on the colour widget. 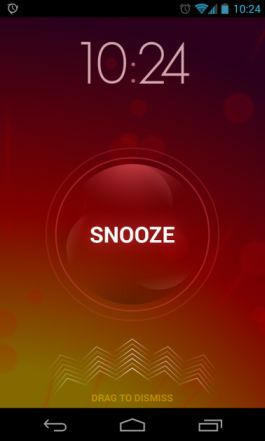 The interface of the Timely Alarm Clock app is rendered in super high-def with brilliant visuals so that you have the best interactive alarm clock at your disposal. The alarm clock makes sure you wake up and to do this it not only wakes you up with cool graphics and a melodious sound but makes sure you are up and for that it asks you simple math questions to open up your brain, and the alarm will obviously stop only when you have answered the question correctly. The auto detect within the app works fine too for when you pick and flip the phone the alarm go to auto snooze. 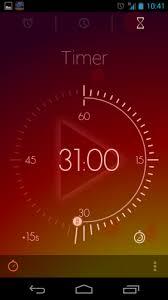 In fact the sensors in the Timely Alarm Clock Android app are optimized in a way that once picked up in the hand, the sound will drop for you to ultimately turn it off. The days of the week are visible at the top and the labels for each day are available in a list below the chosen day. The stopwatch in built as a timer too has superb graphics and appear as a triangle on the clock once the time is set. This then reduces in size as the time keeps ticking, which is a great way to get the adrenaline rushing. So that’s Timely Alarm Clock for you, a timely wake up call for your everyday sleep that keeps you in the daily groove and wake up on time to make your moves. Download it for free from Google Play Store today!